Toblerone is a Swiss brand of chocolate bar. Many people don't notice that the Toblerone mountain logo also conceals the figure of a bear. Not a lot of people know that. Famous for its large variety of sizes, which range from small snack-sized to enormous multi-kilogram bars. The bars are staples of duty-free shops. 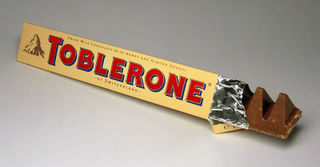 For more information, see the article for Toblerone on The Other Wiki or visit the official website. They are quite common in supermarkets around the world, so they can be found easily if you ever feel the urge for that distinct taste of almond, nougat and honey mixed in dark, white or milk-chocolate. Not to be confused with The Toblerone, although there are similarities in that Toblerone (the chocolate) can have an overwhelming presence if too much is taken in at once, much like The Toblerone. Also not to be confused with the Sideman who calls himself Tobi Lerone. A giant Toblerone is one of the hardest Christmas presents to disguise. Was the punchline ("Chocks away! ") in Chicken Run. It's also the food of The Jaden Smith Anime.